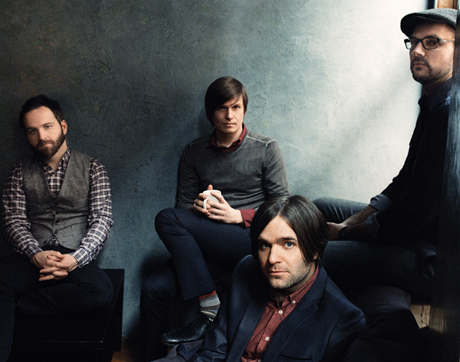 If you can only name one member of Death Cab for Cutie, chances are that person is frontman Ben Gibbard. But if you can name two members of Death Cab for Cutie, that second person is likely guitarist/keyboardist/producer Chris Walla. Well, that's no longer the case, since Walla is leaving the band. In a letter issued through Seattle paper The Stranger, Walla announced that his last show with Seth Cohen's favourite band will be on September 13 at Rifflandia Festival in Victoria, BC. His remaining dates with the group are below. Walla didn't explain exactly why he's calling it quits, but there don't seem to be any hard feelings, since here offered very sincere thank-yous to his bandmates, fans, collaborators and industry team. He noted that the band just finished a new album with Rich Costey (Frank Turner, Muse, Interpol), marking the first time they have worked with an outside producer. He added, "Deciding to leave the band was not, and is not, easy. It's really, really sad." Short version: I'm leaving Death Cab for Cutie. My last show with the band will be September 13, 2014, at the Rifflandia Festival in Victoria, BC. I hope you guys can make it. I am also grateful to, and deeply humbled by, all of our fans. Without you, music would be mere 'content', and nothing could possibly be sadder than that. Thank you all, so dearly. We've just finished our eighth album, which is our first with an outside producer. That producer is a fellow named Rich Costey, and working with him in this capacity is one of the greatest joys of my professional life. Thank you, as well. There are so many others to whom I am grateful — our crew, our management, our families, the Atlantic, Barsuk and Elsinor labels, the Billions team. Thank you all. Deciding to leave the band was not, and is not, easy. It's really, really sad. I love my bandmates, and I'm proud of what we've done, and mercifully, those things don't change with my departure. Moving forward, my plans are simply to continue making music, producing records, and erring on the side of benevolence and beauty whenever possible. Darkness may find me, but I shall never choose it. Gibbard also issued a statement concerning Walla's departure. It reads: "We've had an incredible 17 years of making music with Chris and are very proud of what we've accomplished together, including our 8th studio album which we have just put the finishing touches on. We will miss Chris and wish him all the best in the next chapter of his career. We're excited about sharing new music, and seeing all of you very soon." The new album will be out in early 2015. Walla was a founding member of Death Cab for Cutie and has been with the band since way back in the '90s. He's produced all of their studio albums himself and has also produced for other artists including Tegan and Sara, the Decemberists, Gord Downie and many more. He released the solo album Field Manual in 2008. Now that he's left Death Cab, Walla plans to continue producing records and making music.